The Thai Institute of Directors (Thai IOD) was founded in 1999 and has become the leading Thailand based organization promoting Director Professionalism and Corporate Governance. I am a big fan of the Thai IOD, both for its significant contributions to leadership and Corporate Governance, and also for its strong commitment to anti-corruption and ethical behavior. Last week I had the privilege of attending the Thai IOD’s “Chartered Director Class” (CDC). This is a two day course that is designed to “enhance directorship expertise by strengthening key knowledge and skills.” A prerequisite to attending the Chartered Director Class is the successful completion of the Thai IOD’s “Director Certification Program” (DCP), which is a 5 day intensive course covering the fundamentals of directorship and Corporate Governance. 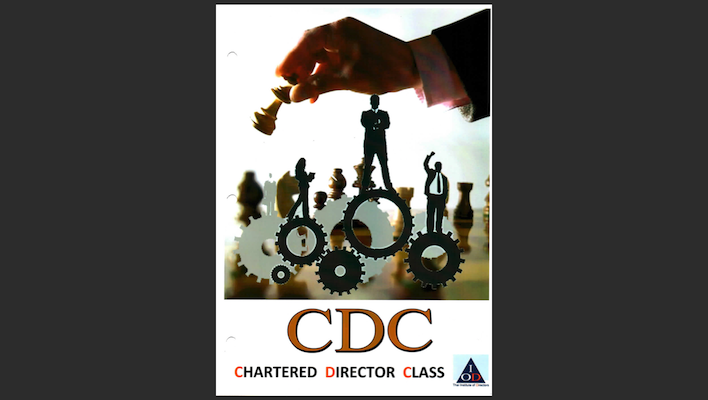 The CDC class was organized as four (4) half day modules covering Accountability, the Art of Directorship, the Strategic Board, and Ethical Decision Making. I’ve attended many professional development classes and seminars. However, with very few exceptions, the Thai IOD courses have consistently been the most rigorous and professionally managed programs I’ve had the privilege of attending. The Thai IOD prides itself on starting its programs on time, and fully utilizing the time allocated for each program module. Thai IOD programs are definitely not long coffee breaks periodically interrupted by brief lectures; these are intensive lectures and engaging professional dialogs with only brief interruptions for coffee and lunch. No, you won’t be going home early … sorry, you won’t beat the traffic. However, you can always be sure to derive maximum value from your time and monetary investment in a Thai IOD program. The CDC program was facilitated by Dr. Bandid Nijathaworn, Banchong Chittchang, Professor Dr. Kriengsak Chareonwongsak, and Dr. Warapatr Todhanakasem. These four gentlemen each have very impressive professional and academic credentials, and are also quite gifted lecturers and facilitators. The facilitators, course materials, and case studies were all very well developed, organized, and presented. Equally important to a professional development program is the quality of the participants. The Thai IOD is very successful in not only attracting and retaining the best quality facilitators, but also the best quality and diversity of participants. Our CDC class had fifteen men and women, Thais and foreigners, coming from a variety of professional and academic backgrounds. I felt privileged to have the opportunity to share this CDC experience with such distinguished and experienced peers. The benefits of Directorship and Corporate Governance training are not limited to the Boards of Directors of Public or Listed Companies. Any professional manager, director, or leader of a listed or limited company can benefit from the skills, leadership, ethics, and governance fundamentals taught by the Thai IOD. These courses are not “cheap”, but they provide great value for both the individual participants and also for the organizations and teams of participants.